· Alta velocidad de descarga y puede proporcionarle la potencia y el tiempo de funcionamiento necesarios para todas sus baterías. · Mano de obra fina, calidad estable, vida útil más larga. · Conveniente para los coches de RC, RC Truck, RC Airplane, RC Helicopter, RC Boat que con el conector de Tamiya. · Un reemplazo perfecto para uno viejo o dañado. · Features:6800 mAh high capacity, long using time, easy to install.High discharge rate and can provide you with the power and run time required for all your batteries.Fine workmanship, stable quality, longer service life. 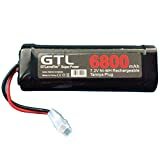 Suitable for RC cars, RC Truck, RC Airplane, RC Helicopter, RC Boat which with Tamiya connector.A perfect replacement for old or damaged one. Descriptions:Made of premium material, reliable and safe to use.Professional design, fit your RC model toy perfectly.Compact and lightweight, portable to carry.Specifications:Capacity: 6800mAhVoltage Rating: 7.2VType: NiMHSize: 13.5*4.5cmColor: blackPackage included:1 x 6800mAh NiMh BatteryNotes:1.Due to the difference between different monitors,the picture may not reflect the actual color of the item. We guarantee the style is the same as shown in the pictures.2.Due to the manual measurement and different measurement methods, please allow 1-3cm deviation.Thanks!